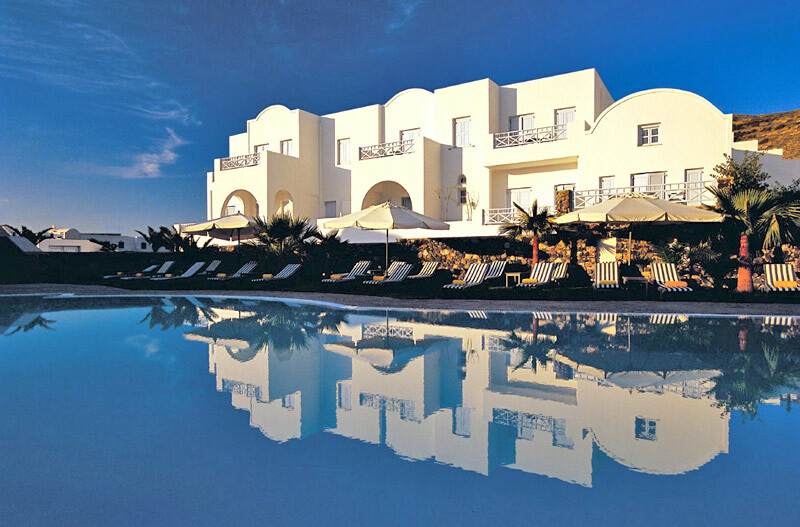 Kastelli Hotel member of SLH Small Luxury Hotels is located in the shadow of the ancient Thira few meters away of the black sandy beach of Kamari reflecting Aegean Cycladic architecture with white washed walls and splashes of colour. The elegant decoration and the ergonomic modulations were designed by the famous Greek designer, Yannis Tseklenis. The staff obeys only one rule, treat guests the same way they would want to be treated if you were on vacation - a golden rule that will make your stay unforgettable. Kastelli Flisvos Gourmet Restaurant: A Gourmet Restaurant with 8 tables open-air presenting a Mediterranean cuisine with the freshest ingredients, masterfully prepared by chefs and under the consultancy and the guidance of Chef Consultant: Francois Rudolph. Santorinian Wines are famous worldwide, a ceremonial candlelight wine tasting will be organized every evening at the small Private Vineyard of Hotel. The hotel also offers a small but beautiful SPA for relaxing and refreshing moments. Children under the age of 2 are free of charge sharing parents double room.